Designer A.J. 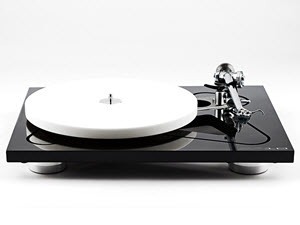 Conti’s mission for the Basis Inspiration was clear from the beginning: to design a turntable system that performs as closely as possible to the unequalled Basis Work of Art at a more accessible cost. Listening to the Work of Art is a revelatory audio experience. Music lovers comment that listening becomes a musical event more than listening session. No other turntable/tonearm combination convinces the listener in this way. It was imperative that the Inspiration display a meaningful degree of this “event feel”. At Bellari we take tube based equipment very seriously. No 48V plate voltages here. We have removed the high cost of point to point wiring and inefficient construction techniques and left the pure analog musical sound that class "A" tubes can offer. Bellari is available to everyone, not just the moneyed few. Bellari is one of those rare values that comes from a perfect blend of function and design. In only seven years Bellari has become a major force in digital recording front ends and for performing musicians. We love our craft and hope music professionals world wide will find joy in using Bellari equipment. 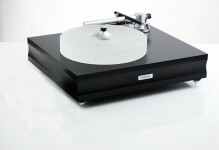 We are excited to introduce a New turntable to our already great selection. The Bergmann is a unique addition as it offers an Airbearing linear tonearm. There are 3 models to this fine product line from Denmark. Offering easy speed change from 33 rpm to 45 rpm. Beautiful fit and finish and a sound quality to match. The Magne and Sindre are available for demo at our shop. 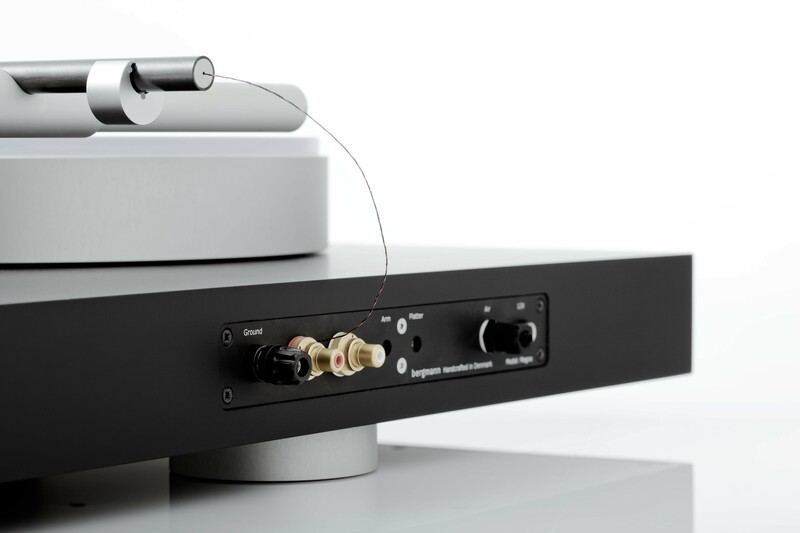 Drop in and experience the Bergmann table on one of our great selection of phono stages. 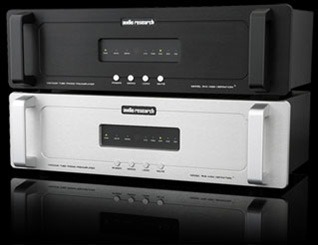 Complete line of power amps, pre amps, phono stages, integrated and digital gear. Boulders are made for the reproduction of music exactly as it was performed and recorded.  Boulder electronics are transparent, accurate, fast, rugged and reliable with minimal distortion and noise and absolutely no coloration or “sound” of their own. Virtually every Boulder ever shipped is still in use; most remain in the hands of their original owners. We are happy to announce the arrival of Dr. Feickert Products in our shop. The Firebird and the Woodpeck are now on display and ready for your audition. Simple engineering, simple style but amazing performance. More exciting models and accessories to follow. Dynavector is highly regarded as a manufacturer of high performance moving coil cartridges and Super-Stereo based on advanced theory and unique production technology. 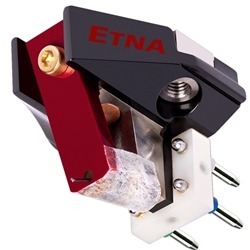 Innovative in design moving coil cartridges since 1975. 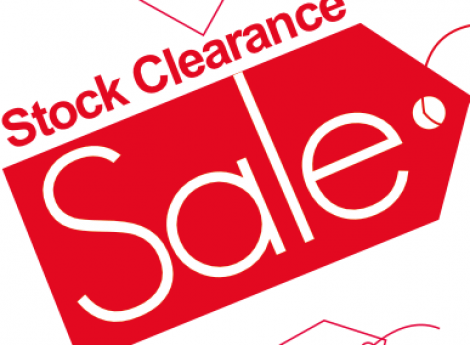 The music lover can be guaranteed listening pleasure at any price point. When you’ve heard it done right, you’ll know immediately. Correct presentation in time is the key element to transparency. We experience this every day in our listening to the un-amplified world around us. Transparency is so much more than just low distortion. It is that rare and special ability of an exceptional piece of audio equipment to get out of the way of the performance and allow the listener to really hear the expression, emotion, and subtlety of each individual performer. The touch and feel of each instrument becomes profoundly clear - the foundation and the soul of the performance. There should be no equipment bias as to the type of music be it contemporary, jazz, rock, classical, and other forms of musical expression. Herron correctly presents to the listener music as performed and recorded! This has been one of my classic cartridges from the good old days of Hi End analog.I am happy to introduce 2 new models now available. LYRA products are characterized by advanced design engineering allied with Japanese artisanal craftsmanship, build and quality. All our products are developed and crafted to be among the very finest available in their category. Every detail of each LYRA product is thought through and executed with extreme care. LYRA is one of the few audio companies with truly original design development capability. Each new product is designed from the ground and up and introduces meaningful industry-leading advances. 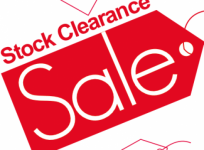 any cartridge we will install and set up , in store, free of charge. Retail on the Etna SL: $ 12,995..
Delos and in stock, Kleos Mono also available. 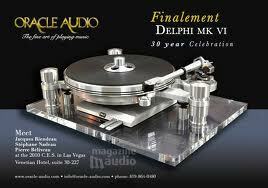 NAGAOKA is a world leader in phono and audio products and accessories. 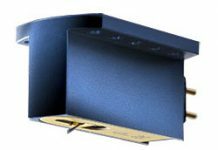 NAGAOKA also makes phonograph cartridges that are used by many renowned companies as original installed equipment and under private label. 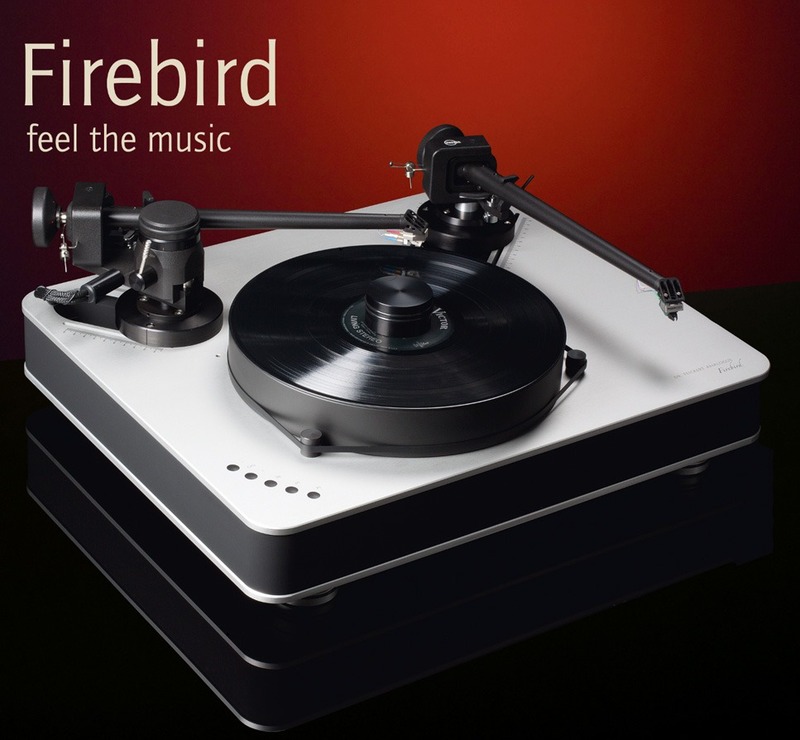 It is one of the last innovative manufacturers to offer a full line of phono cartridge products that meet the needs of many budget segments, turntable tonearm requirements, and performance levels. Each NAGAOKA phono cartridge is manufactured with precision craftsmanship, stringent quality control in material selection and machining, bonding expertise, careful assembly and thorough inspection, perfected through NAGAOKA's long experience in stylus manufacturing technologies. The voice of the soul. And into the concert hall. The way it was meant to be heard. When you listen to an Oracle, You are there! Ortofon is a leading specialist and developer of professional audio products; acclaimed phono cartridges, headshells, tonearms, high-end audio cables, step-up transformers and accessories for installation of cartridges and tonearms. Our company has always worked with sound reproduction. It was founded in Copenhagen, Denmark in 1918 and initially made soundtracks for movies. In 1948 Ortofon developed its first moving coil cartridge. Since then, over 300 different cartridges have been developed and manufactured. We benefit from being established in Denmark, a country recognized for its strong tradition in acoustics and its wealth of other high-end manufacturers. Manufacturers who make hearing aids and acoustic measurement equipment in addition to all aspects of high-end audio. Improve your analog with a New phono stage. 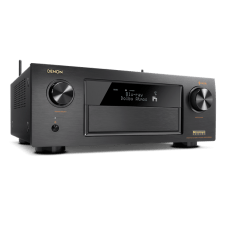 Let us help you upgrade with the best in analog options available. Some offering adjustable gain and loading and we can help you understand how simple it can be. The Hi End analog customer will be excited to see brands like Audio Research, VAC and Sutherland and more. 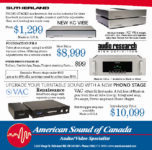 Latest News- ARGENTUM the new top of the line phono stage offering RCA and XLR in now available. 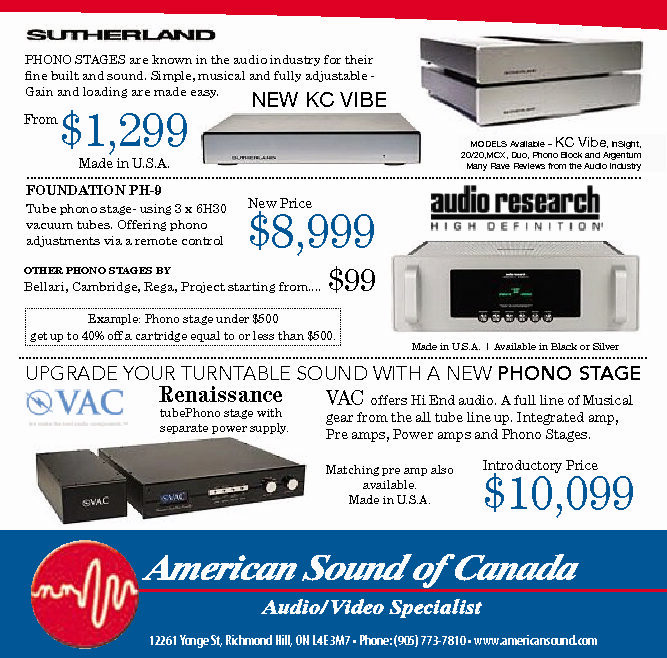 Look for the New KC Vibe replacing the PH3D coming soon, June, the new entry level for Sutherland. Phono Blocks on Demo Now. 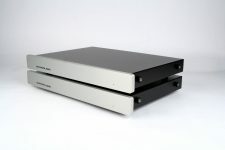 DUO 2 chassis phono stage from Sutherland. 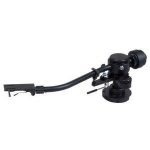 Familiar features known to this product, gain and load setting. The ultimate in spatial listening involvement.